NIA is committed to industry advancement and offers access to a variety of training opportunities and online tools for NIA members and non-members. The following resources are designed to advance your business and increase your industry and technical knowledge. NIA members receive significant discounts for all training programs and exclusive access to additional resources. For questions about NIA’s training tools, please email training@insulation.org. NIA offers 4 distinct training courses to fit the needs of our members and the industry―NIA’s Insulation Energy Appraisal Program (IEAP), NIA's Thermal Insulation Inspector Program, 3E Plus® Insulation Software Training Program, and NIA’s Webinar Series. NIA can customize presentations and training programs for your company. For more information about customized trainings, please email training@insulation.org. The IEAP is a 2-day professional certification course that instructs students to determine the optimal insulation thickness and corresponding energy and dollar savings for a project. NIA is developing the Thermal Insulation Inspector Program which will offer mechanical insulation inspector courses for commercial, industrial, HVAC, and cryogenic applications. NIA’s 3E Plus Insulation Software Training Program teaches users how to calculate the appropriate insulation thickness for any application. 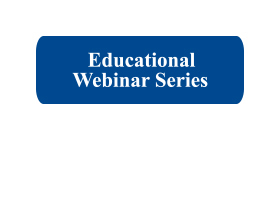 Webinars offer timely business and training information in a convenient virtual format. Archived webinars can be found on NIA’s Vimeo On Demand website. 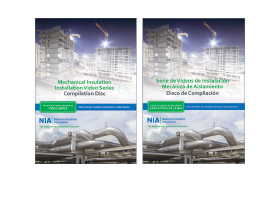 NIA offers a variety of online tools for anyone involved in the industrial and commercial insulation industry. These tools are specifically geared toward thermal insulation for mechanical systems. These installation videos cover 7 different insulation topics and provide a general overview and basic how-to guide for mechanical insulation applications. Available in English and Spanish. This Mechanical Insulation Design Guide (MIDG) is designed to assist both novice and knowledgeable users in the design, selection, specification, installation, and maintenance of mechanical insulation. This 2-hour online training course is designed to educate the industry and promote the benefits of proper design, installation, and maintenance of mechanical insulation. 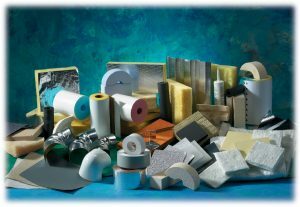 The Insulation Science Glossary contains a list of basic and advance insulation industry terms and their definitions. It is reviewed quarterly by NIA’s Technical Information Committee. 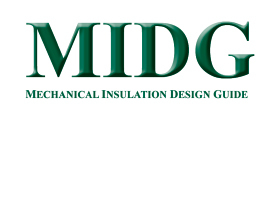 The MIDG includes 8 mechanical insulation calculators for the industrial, manufacturing, and commercial markets—they are fast, free, and functional tools for calculating energy savings, financial returns, and more. Vimeo On Demand is an online video streaming training portal for users to access NIA’s webinars, the Mechanical Insulation Installation Video Series, plus much more. Check back frequently for new content.